Governor Ige noted, “We have a skilled contingent of scientists, geologists, meteorologists, and health experts whose work is being supported around the clock by emergency officials and law enforcement personnel from federal, state and county agencies. They are continuously scrutinizing the activity within Kilauea volcano and providing clear, carefully thought-out advice with the purpose of keeping the public safe and informed. “This is a time to listen to the experts on-site and to trust what they are reporting and recommending. The experts are telling us there is no danger from the eruptions to anyone outside the areas that have been evacuated. There is no threat of a tsunami. Air quality is being closely studied and is of most concern in the immediate area inside where the volcanic activity is taking place. “Our foremost concern is for the residents in the affected communities. They are receiving all available support from government agencies and officials to cope with the volcano activity and carry on with their lives as best as possible. “Visitors to Hawaii can be assured that the volcanic activity is having no effect whatsoever on the other islands, Oahu, Maui, Molokai, Lanai and Kauai. Visitors can book their trips comfortable in the knowledge that their vacation experience will provide all the enjoyment they expect when coming to our beautiful islands. Kilauea has been an active volcano since 1983 and is one of Hawaii’s most popular attractions. Over the years residents and visitors have been drawn to the wonder of seeing nature at work in the creation of new land via tours or visits to Hawaii Volcanoes National Park. Most of the park is currently closed until further notice. NORTH SHORE, OAHU, HI – Turtle Bay Resort on Oahu’s Fabled North Shore is hosting the third-annual Wanderlust Oahu yoga and music festival from Feb. 26-March 1, 2015, and has recently rolled out special room rates for attendees. Enjoy all of the music performances, world-class speakers, activities and events of Wanderlust Oahu with spacious newly renovated Epic Ocean View, Deluxe Ocean View and Premier Ocean View Guest Rooms at Turtle Bay Resort – all starting at $278 per night. Each room features all-new furnishings, bedding and completely remodeled bathrooms. Share the fun in Deluxe Ocean View rooms, which offer two queen beds and can sleep up to four guests. Or relax in 725 square feet of space with spectacular views of the ocean and resort in a newly renovated Ocean View Junior Suite for $369 per night, featuring a king bed, oversized guest room and comfortable seating area. For Four-Diamond quality and direct beach access, the resort’s 42 beach cottages offer unparalleled luxury with 15-foot ceilings, deep-soak tubs and an exclusive cottage concierge – all for a special Wanderlust rate of $559 per night. Book online at oahu.wanderlustfestival.com or call (866) 827-5321 and mention Wanderlust Oahu to receive these rates, valid from Feb. 26-March 1, 2015. Turtle Bay also offers special kamaaina appreciation rates and the Kamaaina Loyalty Program that rewards Hawaii residents each time they stay. Call (808) 293-6000 or visit turtlebayresort.com. Be one of the first to experience Turtle Bay’s recent renovations,that besides the renovated guestrooms also include two restaurants with farm-to-table and sea-to-table cuisine; the Nalu Kinetic Spa and Wellness Center; and two retail outlets and ocean-view fitness center. Turtle Bay also offers excellent value with its on-site activities – from stand-up paddle boarding and surf lessons to 36 holes of championship golf. Turtle Bay is the only resort on the North Shore on Oahu, where the “7-Mile Miracle” begins. Ideal for watermen, wave watchers or waders, Turtle Bay is at the epicenter of activities, events and adventures. To discover the destination and stay up to date on the Turtle Bay experience, check out Oahusfablednorthshore.com. 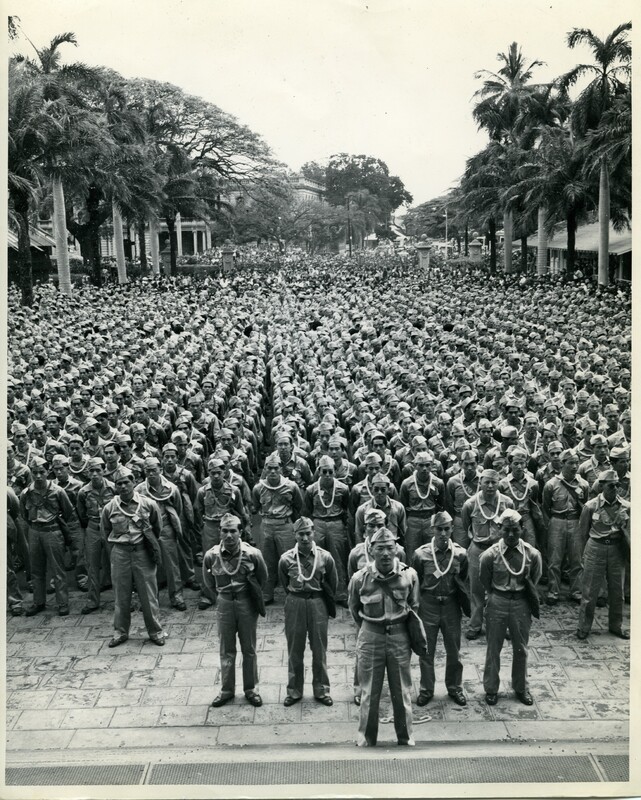 Newly enlisted soldiers of the 442nd Regimental Combat Team gathered on March 28, 1943 in front of the historic Iolani Palace at the heart of downtown Honolulu for a memorable farewell ceremony. The Battleship Missouri Memorial at Pearl Harbor, Hawaii, unveiled a new onboard exhibit in tribute to America’s Nisei veterans. The exhibit includes dramatic photos, news articles and descriptive text on large display panels, and a video that tells the story of how these Americans of Japanese ancestry overcame the prejudice and questioning of their loyalty at the war’s outset to earn acclaim and respect with their courageous exploits in Europe and the Pacific. The exhibit stretches more than 50 feet and is located one deck below the main deck near the ship’s galley. “This new exhibit highlights the extraordinary achievements of America’s courageous Nisei soldiers and shows how they proved to our nation during the most stressful of times that being an American isn’t defined by race nor religion,” Michael A. Carr, President and COO of the Battleship Missouri Memorial, said. On December 7, 1941, hundreds of Hawaii’s Nisei residents were serving on active duty with the Army or Territorial Guard when Imperial Japan attacked Pearl Harbor and other defense installations. Many of these Nisei were soon removed from their units by a government suspicious of their devotion to America. Most went on to form the 100th Infantry Battalion or to enlist in the Military Intelligence Service starting in 1942. In 1943, thousands more Nisei answered a call for volunteers to serve in the 442nd Regimental Combat Team. The 1399th Engineer Construction Battalion was activated in April 1944. The 442nd Regimental Combat Team lived up to its motto of “Go for Broke” with incredible battlefield exploits in Europe. The 442nd became the most decorated unit for its size and duration of service in U.S. military history. The Military Intelligence Service took part in every major U.S. military command and battle in Asia and the Pacific, translating Japanese-language communications. The MIS is credited with saving thousands of lives and shortening the war. The 1399th Engineer Construction Battalion built 54 major defense projects on Oahu. The War Department refused General Douglas MacArthur’s request to relocate the 1399th to the Philippines, considering the unit essential to Hawaii’s defense. The Battleship Missouri Memorial is open daily from 8:00 a.m. to 4:00 p.m. General admission, which includes choice of an optional tour, is $22 per adult and $11 per child (4-12). Military, kama‘aina (local resident) and school group pricing is available. For information or reservations, call (toll-free) 1-877-644-4896 or visit USSMissouri.org. Beginning June 23, Kauai Marriott Resort will offer the Kalapaki Kids Club summer program for youngsters ages 5 to 12 years old. The day-long program includes lunch, snacks and a t-shirt. The cost per day is $70 per child for hotel guests and $80 per child for non-hotel guests. “Silly” Saturday – Get ready, get set, get wet! A balloon toss is always fun with a friend or two. Let’s not forget about our obstacle race right on the beach. You will also get to decorate your own visor to wear under the warm Hawaiian sun. Aloha Sunday – Learn to hula and show off to your friends back home. Hear a bit about our volcanoes here in Hawaii and how our islands were made long ago. Hawaiian story telling is also planned especially for you. Hawaiiana Monday – We’re going on a scavenger hunt! You will get to see some of the special animals and plants that have made our Gardens of Kalapaki their home. Get a cool Hawaiian petroglyph picture painted on your arm or leg and string fresh flower lei for you to give or wear. Keiki Tuesday – Fun in the sun with sand sculpting. You will also find out what your name is in Hawaiian and decorate a luggage tag for your journey back home. You’ll also learn about the marine life found right here in the Pacific Ocean. Makahiki Wednesday – Go “coconuts”, with coconut bowling. You’ll also learn a thing or two about some of the games (old and new) that the children of Hawaii have fun playing every day. At Kauai Marriott Resort on Kalapaki Beach, families of all ages can enjoy the results of a recently completed $50 million makeover that transformed all areas of the resort. Along with the refreshed guestrooms, the beachfront resort has a new children’s swimming pool with a slide and water features, which complements the 26,000-square-foot signature swimming pool. Youngsters, including teens can also spend time in the new recreation room. Kauai Marriott Resort is home to a vibrant collection of more than 1,500 red, orange, yellow, and white koi fish, teeming in anticipation and waiting to be hand-fed each morning by resort guests in the Gardens of Kalapaki. From their serene and elegant nature, to the frisky, unforgettable splashing and churning of the pond during feeding time, koi fish feeding is offered daily. Kalapaki Kids Club reservations are required. Parents and guardians must accompany their children to and from Kalapaki Kids Club. For more information and details on the most current price and programs that are subject to change without notice, please visit wwww.kauaimarriott.com or call (808) 246-5166. Located on the serene, family-friendly Kalapaki Beach, the centrally located, 800-acre oceanfront Kauai Marriott Resort on Kalapaki Beach makes it easy for guests to experience the pure splendor of Kauai, world renowned for its natural beauty, isolated beaches, carefree ambience and exhilarating activities. Fresh off a $50 million renovation, Kauai Marriott Resort guests will relax in completely new guest rooms and suites while enjoying the island’s most impressive swimming pool with five saunas. Experience a mixture of creative island-inspired cuisine masterfully prepared at the oceanfront Kukui’s Restaurant featuring the new Toro-Tei sushi bar. Golfers can tee up at this premier Kauai Lagoons golf club, a Jack Nicklaus Signature course offering breathtaking ocean views. To start your island discovery at the new Kauai Marriott Resort, please call (800) 220-2925 or (808) 245-5050 or visit http://www.kauaimarriott.com. Follow Marriott Resorts Hawaii on Twitter @marriotthawaii or like us on Facebook at http://www.facebook.com/MarriottHawaii. Waikoloa Beach Marriott Resort & Spa on Hawaii Island has a value added Island Treasure package designed to make a Hawaiian vacation more enjoyable. “We’ve made it more enticing for leisure travelers to experience all our resort hotel amenities and offerings, from sumptuous cuisine made with fresh local produce and organic Kona coffee grown here on Hawaii Island, to lively Polynesian music and entertainment at our popular Sunset Luau,” said Bill Countryman, general manager of Waikoloa Beach Marriott Resort & Spa. * One-time $300 hotel credit which can be applied toward Hawaii Calls Restaurant & Lounge, Kona Coffee Shoppe, room service, Sunset Luau held every Saturday and Wednesday, Internet, and valet parking. Valid for stays through December 31, 2012. A minimum four-night stay and advanced reservations are required. Based on availability, restrictions may apply. For reservations, visit http://www.waikoloamarriott.com or call 808-886-6789 with promotional code ZX0. Waikoloa Beach Marriott Resort & Spa on Hawaii, the Big Island is located on 15 oceanfront acres overlooking ‘Anaeho‘omalu Bay and just 18 miles north of the Kona International Airport at Keahole. Offering 555 contemporary guest rooms, suites and cabanas with private lanai and spectacular views, 5,750 square-foot world-renowned Mandara Spa and a fitness center with state-of-the-art equipment from cardio to free weights, Hawaii Calls Restaurant & Lounge with an outdoor lanai for ocean view dining, three pools including the Infinity pool with lava pots, nearby Waikoloa Golf Club offering 36 holes of championship golf and shops, restaurants and boutiques at The Kings’ Shops and the newly-opened Queens’ MarketPlace. For more information or reservations, visit http://www.waikoloamarriott.com or call toll-free at 800 922-5533 or the hotel at 808 886-6789. Follow Marriott Resorts Hawaii on Twitter @marriotthawaii or on Facebook at http://www.facebook.com/MarriottHawaii. Polynesian Cultural Center (PCC) has been selected “Best Family Attraction,” a distinguished honor, as chosen by readers in Honolulu magazine’s annual “Best of Honolulu” edition. This is the third time PCC has been honored with a “Best of Honolulu” award. Each year, Honolulu magazine compiles a comprehensive list of the best that Oahu has to offer and readers vote to determine the winners in a variety of categories, including food, shopping, entertainment, services, fitness, and celebrations. PCC has previously been recognized with two “Best of” awards, including “Best Place to Take Visitors” in 2010 and 2011. In addition, Hawaii’s No. 1 entertainment critic, Wayne Harada of the Honolulu Advertiser, awarded Ha: Breath of Life the “Best show, public” in his annual Waynie Awards for 2009. PCC offers a variety of experiences, activities, and fun for the entire family. Guests can start off the day exploring PCC’s six island villages and two exhibits and also try their hands at the new “Go Native!” activities. The “Go Native!” activities offer exciting hands-on opportunties to do as natives do, whether it’s scaling coconut trees in the Samoan Village, paddling outrigger canoes in the lagoon, cooking in an umu (Samoan above-ground oven), or spear throwing in the Tahitian Village. For those in the mood for a more relaxing experience, the PCC offers guided canoe tours on a tranquil fresh water lagoon that weaves throughout the Center. The lagoon also hosts Hawaii’s only waterborne pageant, Rainbows of Paradise, which features colorful song and dance from Hawaii, Tonga, Tahiti, Samoa, Fiji and Aotearoa — all performed aboard double-hulled canoes. In the evening, families can dine at the PCC’s newly rennovated Gateway restaurant buffet, with its ono (delicious) cosmopolitan spread, or upgrade to the Alii Luau, Hawaii’s most authentic luau, before closing out the day at the critically acclaimed evening show, Ha: Breath of Life. Since opening in summer 2009, Ha: Breath of Life has entertained more than one million guests, receiving rave reviews from locals and visitors alike. With a cast of more than 100 performers, Ha captivates audiences with the story of its central character, Mana, who they follow through the universal life themes of boyhood, love, loss and responsibility. From the apprehension of youth, to the stirrings of young love, to even the sorrow of death, Ha takes the audience on an exhilarating and emotion-filled experience through the sights, sounds and dances of Polynesia. To add to PCC’s already impressive list of offerings, within the next year the Center plans to unveil many new and exciting enhancements, events and attractions. For more information or to make reservations, visit Polynesia.com or call the PCC ticket office at (800) 367-7060. On Oahu call (808) 293-3333. Founded in 1963 as a non-profit organization, the PCC has entertained more the 36 million visitors, while preserving and portraying the culture, arts, and crafts of Polynesia to the rest of the world. In addition, the PCC has provided financial assistance to 17,000 young people from over 70 different countries while they attend Brigham Young University-Hawaii. As a non-profit organization, 100 percent of PCC’s revenue is used for daily operations and to support education. Waikiki Beach Marriott Resort & Spa is making it easier to “hang ten” with the introduction of a new surf school and vacation package! Champion long board surfer Kai Sallas continues his father’s tradition of surf instruction with the creation of Pro Surf School Hawaii, located at Waikiki Beach Marriott Resort & Spa. His long history and love for the sport began when he was 12 years old, stemming from dad Jr. Sallas who taught young Kai and helped revitalize the surfing culture as one of the original Waikiki Beach Boys. Now, the oceanfront resort is offering a value-added Surf Package for guests to enjoy the waves and learn to surf with Kai and his professional team! A minimum three-night stay is required. Children must be at least 11 years old and know how to swim. Valid through December 25, 2012. Based on availability, restrictions may apply. For reservations, visit http://www.marriottwaikiki.com or call 1-800-367-5370 and quote promotional code SPO. Located in the tour lobby of Waikiki Beach Marriott Resort & Spa, Pro Surf School Hawaii also offers lessons in stand up paddle and surf tours. It is open daily from 8:00 a.m. to 5:00 p.m. For more information, visit http://www.prosurfschoolhawaii.com or call (808) 343-9667. The Waikiki Beach Marriott Resort & Spa fronts one of the best stretches of Waikiki Beach. Conveniently located in the heart of Waikiki, the hotel offers 1,310 refurbished guest rooms and suites with private lanai providing spectacular views of world-famous Diamond Head and Waikiki Beach. Other amenities include Kuhio Beach Grill, featuring the best in Pacific Rim cuisine; Sansei Seafood Restaurant & Sushi Bar and d.k Steak House; Arancino di Mare Italian Restaurant; newly transformed Moana Terrace, offering live Hawaiian entertainment nightly; Seattle’s Best Coffee; Paul Brown’s Spa Olakino * Salon; Pro Surf School Hawaii; two freshwater, heated swimming pools; 10-person whirlpool; new 24-hour fitness facility; business center with 24-hour Internet access; high-speed and wireless Internet access throughout the resort’s guest rooms and public spaces; shops and boutiques; and Hawaiian cultural activities. For more information, visit http://www.marriottwaikiki.com. Follow Waikiki Beach Marriott Resort & Spa on Twitter @marriottwaikiki or like us on Facebook at http://www.facebook.com/MarriottWaikiki. Halau Hula Olana. Hawaii’s premiere hula event of 2012, the Moanikeala Hula Festival will be held on Saturday, Jan. 21, in PCC’s Pacific Theater. Beauty, grace and tradition come alive as hula halau (hula schools) from across Hawaii and Japan take the stage at the Polynesian Cultural Center’s (PCC) 22nd Annual Moanikeala Hula Festival, captivating crowds in this stunning hoike (festival). Hawaii’s premiere hula event of 2012, the Moanikeala Hula Festival will be held on Saturday, Jan. 21, 2012, from 10 a.m. to 2 p.m. in PCC’s Pacific Theater. 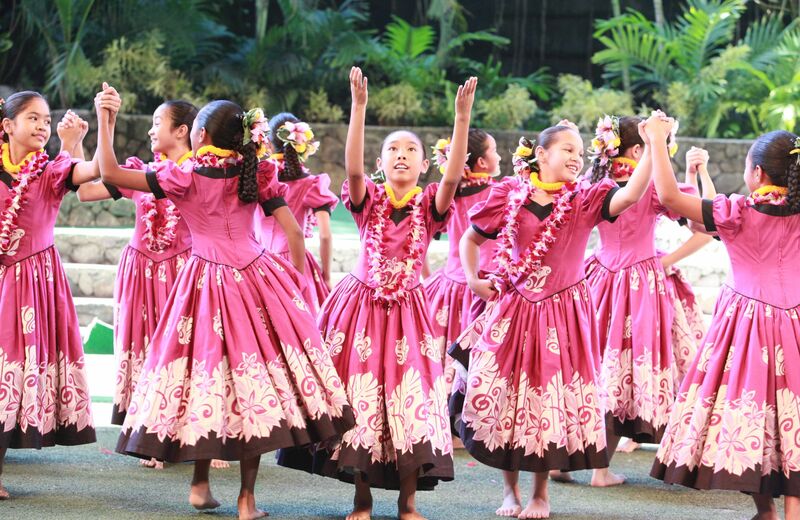 Starting as a keiki (child) hula competition over two decades ago, Moanikeala has since blossomed into an annual hoike featuring dancers of all ages whose elegant movements paint pictures and narrate stories of ancient and modern Hawaii. The event showcases many of the world’s most talented halau and honors Aunty Sally Wood Naluai, PCC’s first Hawaiian Instructor, perpetuating her over 60 year passion for teaching the magnificent Hawaiian art. Aunty Sally taught numerous haumana (students), from the Center’s opening in 1963, until her retirement in 1980. After retiring, she continued to work with the PCC as a consultant until she passed away in 2000. Many of her past haumana have since formed their own halau. Festival admission is $10 for adults ages 16 and older, and $6 for keiki from ages 5 to 15. Admission is free for Kamaaina Annual Pass holders and keiki younger than 5. Founded in 1963 as a non-profit organization, the Polynesian Cultural Center (PCC) has entertained more than 36 million visitors, while preserving and portraying the culture, arts and crafts of Polynesia to the rest of the world. In addition, the PCC has provided financial assistance to nearly 17,000 young people from more than 70 different countries while they attend Brigham Young University-Hawaii. As a non-profit organization, 100 percent of PCC’s revenue is used for daily operations and to support education.